Address: 3950 S. Las Vegas Blvd. 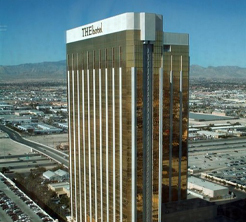 THEhotel is a 43-story boutique hotel on Mandalay Bay's property, but with its own entrance, check-in and a lobby, complete with a cosmopolitan look ・including artwork from Arturo Herrera, Jasper Johns and Andy Warhol. 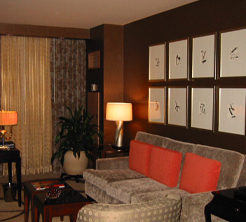 Once in-room guests will be amazed at the dark wood and rich earth tones of the dwelling, creating a modern look. The living rooms boast 42-inch plasma screens, half-baths for guests, private bar and more. A separate bedroom has a second, 32-inch flat-screen TV and luxury linens. Bathrooms feature separate tub and shower and another flat-screen TV. All suites are serviced by high-speed internet connections and have a combined fax, printer and copier. 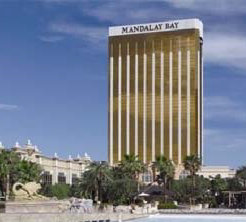 Guests have access to amenities in Mandalay Bay, but THEhotel offers a little bit extra. Located atop THEhotel, Mix restaurant and lounge offers unparalleled views of the Vegas Strip from its floor-to-ceiling windows and a gourmet menu.